Review date: 1st February 2007. Griffin Technology, home of one hundred million billion iPod accessories, make a few other products. 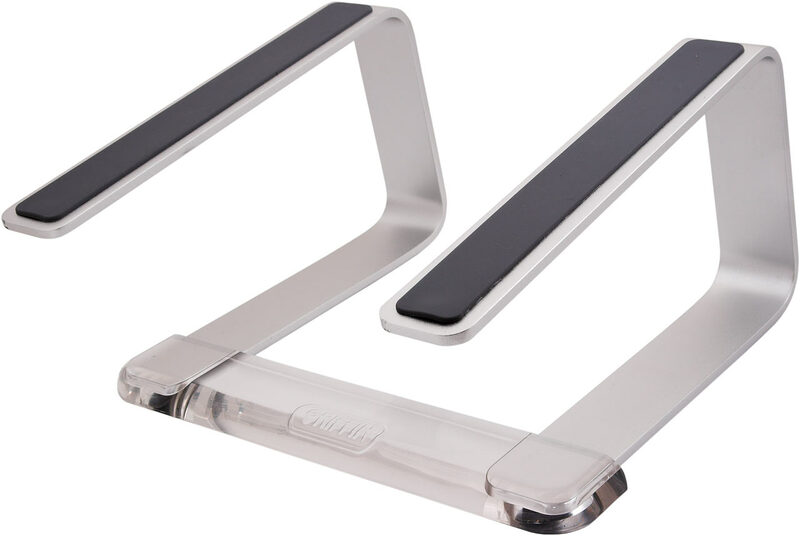 One of those products is, or at least was, the "iCurve" laptop stand. The iCurve is one of those things that walks the line between "deceptively simple" and "overpriced piece of plastic". It's an uncomplicated concept - a piece of plastic you can stand a laptop on when you're using an external keyboard and mouse. The laptop then runs cooler, its screen is raised to a more useful altitude for normal desktop use, and it has a space under it in which you can park the keyboard when you're not using it. That's about it for the iCurve, really. I think it sold quite well, despite listing for $US39.99. I certainly didn't notice iCurves ever being dumped at a discount. Part of the iCurve's popularity came, no doubt, from the fact that it was a nifty looking swoopy piece of clear moulded acrylic. It really did almost fade away under your laptop, and it still looked kind of sculptural when it was sitting there empty. The iCurve wasn't perfect, though. Griffin had a couple more ideas, and turned them into the new Elevator, which went on sale about four years after the iCurve. The Elevator is, fundamentally, the same as the iCurve. It's about the same size, taking up a desk footprint about about 25cm (10 inches) square. It performs about the same function. And it costs the same forty US bucks less a penny. And you could still make something that does the job yourself out of a few bits of wood. The Elevator doesn't look as good as the iCurve, if you ask me, because it's now a multi-piece assembly. Therein, however, lies its slight functional superiority. The three parts of the Elevator are a simple friction fit, so you can take it apart when you want to move it. You still get one piece of spiffy clear acrylic, but the two bent supporting arms are now aluminium, with broad grippy rubber pads on top. The tops of the iCurve's arms were plain slick acrylic, which meant you needed a laptop with rubber feet that lined up with the arms. 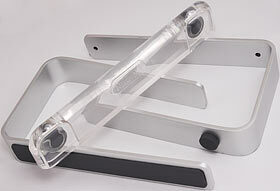 Accordingly, Griffin only sold the iCurve as a stand for iBooks and Powerbooks. Anybody else was welcome to try, but Griffin disclaimed all responsibility if their laptop slid off the thing and onto the floor. The Elevator's arms, though, will grab pretty much any laptop you care to name. Only if a laptop has feet in very specifically awkward places will there be a problem, and even then you're more likely to just end up with your laptop tilted half a degree left or right. Basically, you just put your laptop on top of the Elevator, and it sticks securely. You can bounce it up and down on the springy aluminium arms and still feel quite confident. Without having to get drunk first or anything. Here, an old 15 inch ThinkPad graces the Elevator. There's lots of room under the computer for even bulky keyboards, and a mouse, and various other gizmoes. More USB devices, maybe an external drive, whatever. Here's a 17 inch Dell on the Elevator. You could easily perch an even bigger laptop there; the arms are strong and the rubber is grippy. If you've got one of those ludicrous 19 or 20 inch machines, it'll be fine. The same goes for very heavy 17 inch "desktop replacement" laptops, which are often particularly in need of better ventilation. The ones with desktop-PC CPUs and high powered graphics cards can, literally, blister the varnish on a desk; if you're going to play 3D games on them, it's thus practically essential that you put them up on some kind of stand, even if it's just a bit of wood under each corner. Tiny 12 inch notebooks should be OK, too. The outside edges of the Elevator arms are about 10 inches apart, and that just about matches the width of the tiniest 12 inchers. Anything smaller than that, you probably don't want to move too far away from your eyes anyway. No, it's not as pretty as the iCurve, but the Elevator is definitely more useful. You can take it apart to move it, rather than be stuck carrying around an object less space-efficient than a hatstand. And the Elevator also does not hand a ticket to Smashville to laptops that don't perfectly fit it. Just about anything should sit on it securely. 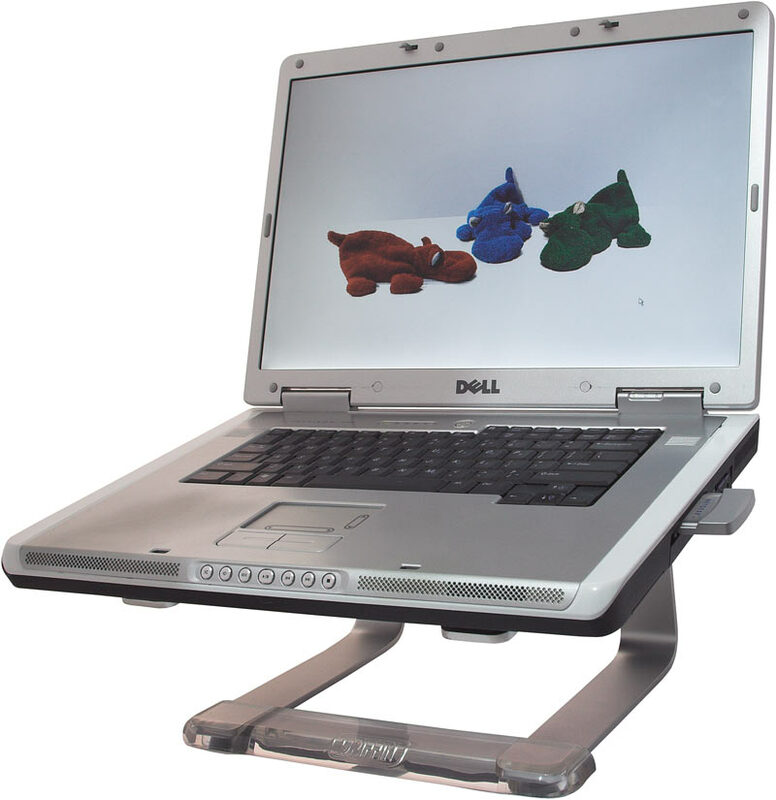 Like the iCurve, the Elevator lifts the back of your laptop about six inches and the front about four - which, incidentally, means the screen will line up better with normal desktop monitors, in case you want to do multi-monitor tricks. 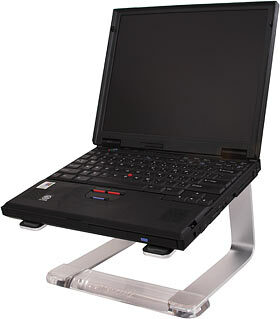 That gives the laptop around a 15 degree forward tilt. 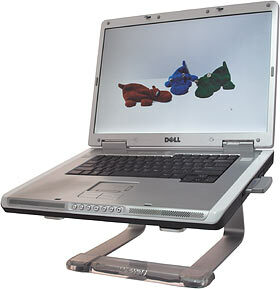 This makes it easier to use the laptop's own keyboard or pointing device than it would be if the elevated computer were level, but this is obviously still not what you're meant to do. It'll be fine if you're just using the Elevator to put your laptop at a more suitable altitude for movie watching on the coffee table in a hotel or something, though. If you want a stand that makes it easier to use the laptop without an add-on keyboard and mouse, you can get them. They're low-rise wedge-shaped arrangements, often provided with USB-powered fans. There are lots of other options, which vary in their weirdness; some of them are apparently usable on your lap as well as on a table, but I think the ergonomic advantage of angling the keyboard would be lost, there. All you'd be doing is reducing your susceptibility to Scalded Thighs Syndrome. The Elevator is as much "desktop replacement" hardware as a lot of people need, especially now that we're past the bad old days of laptops that lacked important equipment if you didn't hook them up to an optional docking station. The Elevator does what it says on the label. It's up to you, of course, to decide whether this is worth the $US39.99 price - which seems to be more like $AU70, here in Australia. Shipping charges may be a bit steep, too; the Elevator's less bulky than the iCurve, but it still doesn't come in a tiny box. If you're even slightly handy, you certainly could quite quickly make a thing that does what the Elevator does. You'd need some sticky stuff for the top (or nails sticking out of the front of the arms so the laptop can't slide down past them, or something), but it'd still hardly be a difficult project. If the Elevator were $US20 delivered, I'd give it an unequivocal Recommended vote. At its list price - from which you should not expect to see much of a discount - it's a simple but worthy product that costs a bit too much. I suppose it still doesn't cost much compared with the thing you put on top of it, of course. And it would, as they say, Make A Great Gift. Review Elevator kindly provided by Griffin Technology.